Cases of the multi-drug resistant form of tuberculosis (MDR-TB) -- which can brush aside at least two of the best first-line anti-TB drugs -- are on the rise. The need is early diagnosis and treatment. Diagnosing this form of tuberculosis requires a specialized intermediate reference laboratory (IRL) to carry out the culture and sensitivity of sputum. There is no such laboratory in Karnataka. Indian Development Foundation congratulates Dr. Manmohan Singh on being sworn in as the Prime Minister of India for the 2nd term. With dynamic leadership qualities and an excellent team at the Centre, we are confident that Dr. Manmohan Singh Ji will be able to fulfill his unfinished agenda in the 2nd term. Congratulations Hon'ble PM and team India for the 2nd innings. 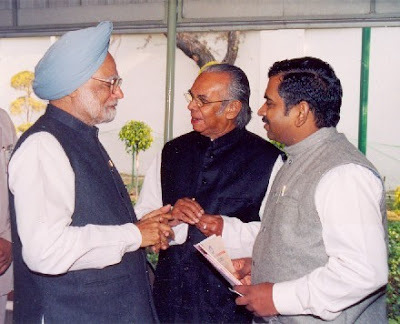 At this juncture, Indian Development Foundation cherishes the golden meeting the team (Dr.ARK Pillai and Dr. Narayan B. Iyer) had with the PM of India during Anti-leprosy week (2005). While Indian Development Foundation marches on the path of providing excellent social service to the people of India, we seek blessings and guidance from the PM of India for our ongoing humanitarian mission. The HKNS-MB team (Hind Kusht Nivaran Sangh -Maharashtra Branch) met on 22ndMay 09 at Acworth Leprosy Museum, Mumbai. Dr. Jairaj Thanekar chaired the session which was attended by Dr.A.R.K. Pillai, Dr. R. Ganapati, Dr. Pednekar, Dr. Pandya, Dr. W.S. 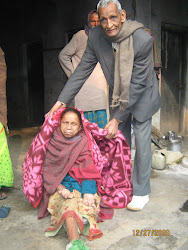 Bhatki, Dr. V.V. Pai, Mr. Achrekar, Mr. Kadam, Mr. Mehendale and Dr.Narayan B.Iyer. The members went round the Leprosy Museum which got a facelift recently. The team also discussed on the re-opening of the Museum shortly. The team discussed on various strategies plan in community based programmes for leprosy cured persons and also organising various awareness campaigns. IDF young ambassador Shiloh Jessie Francisca from Chidambaram in Tamil Nadu visited Mumbai on a personal visit. Dr. Pillai and Dr. Narayan met Shiloh and her family members. IDF team appreciated Shiloh's commitment to social work at a young age. I take every opportunity to meet people wherever i go, said Shiloh. 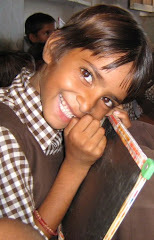 Though i am on a holiday in Mumbai, i thought it fit and proper to meet IDF team, she expressed with a smile. Shiloh is known for her commitment and dedication to social work. I am happy that my cousin, Shiloh could get the maximum sponsorships for the underprivileged children studying under IDF's care, Junia (Shiloh's cousin) expressed with beaming eyes. We congratulates Indian Development Foundation in its health, education and rural development programme, expressed Mr. Raj Shahi, Regional Manager-West, Domino's Pizza India Ltd.
Domino's team at a couple of occasions had the golden opportunity of participating in the social responsibility programmes of IDF. 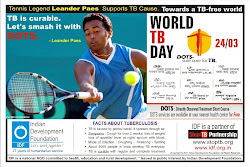 We could collaborate with IDF and also create TB awareness programme during World TB Day, expressed Mr. Raj Shahi. Mr. Raj Shahi and Mr. Ravindra Shelar from Domino's visited IDF office on 11th May and extended a helping hand in its health and education programmes. Dr. ARK Pillai and Dr. Narayan B. Iyer from IDF explained various activities of IDF and the avenues open for Domino's to support IDF. They also thanked the Domino's team for coming forward in supporting the underprivileged children under IDF's care. 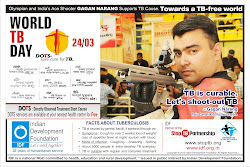 To start with, Domino's will take up the TB awareness programme and also student sponsorship programmes of IDF, Mr. Raj Shahi said. NEW DELHI: A crucial finding by clinicians in Mexico, the country where the deadly H1N1 flu virus originated, could have India worried. Initial observations made by the WHO, Centre for Disease Control and Prevention and the Mexican clinicians who studied the first 40 deaths in Mexico show that people with underlying conditions like asthma, cardiovascular diseases (CVDs), immunosuppressive illnesses like HIV, diabetes and TB appear to be at greater risk of hospitalisation or death if infected with H1N1. CHENNAI: Concerned at the possibility of wild elephants contracting tuberculosis from a captive elephant that is affected with the disease, the Madras high court has asked the government to immediately shift the TB-affected temple elephant out of the Theppakkadu elephant camp in the Nilgiris. The 58-year-old Andal, an elephant of Madurai Kallalagar Temple, was taken to the camp in the Nilgiris for treatment on January 28. Objecting to their presence in the Nilgiris, which is home to several hundreds of wild elephants, a public interest writ petition was filed by Elephant G Rajendran, who contended that unless the TB-affected Andal is shifted out of the sanctuary region immediately, many free-ranging pachyderms too would catch infection. The state forest department, admitting that Andal suffered from TB, said it had been quarantined and that the chance of TB spreading to other elephants was remote. A division bench comprising Justice K Mohan Ram and Justice M Duraiswamy, concurring with the submissions of Rajendran, said Andal should be re-transported to the plains and kept at the Kurumpatti zoo. The transportation cost would be borne by Rajendran, it said, adding that the animal should not be made to travel more than 75km a day. Dr. Hepesh Shepherd, Director, Ingraham Institute, Ghaziabad, UP and team visited Indian Development Foundation. Dr. Hepesh Shepherd appreciated the work of IDF in the areas of health, education and rural development. He said his Institute will support IDF's activities and also help in reaching out the poor and the needy. Mr. Rajkumar Michael, former Director of Ingraham Institute who accompanied Dr.Shepherd congratulated Dr. A.R.K. Pillai and IDF team for the excellent social responsibility programmes carried out in the country. Dr. Pillai and Dr. Iyer from IDF expressed their sincere gratitude to the visiting team and for the support extended by Ingraham Institute from time to time.